In deep winter, we tend to eat more heavily cooked, salted and fatty foods, but now it’s time to lighten up. This is a basic sweet and sour dish, easy as making a salad and dressing. Once you have made it, you will come up with infinite variations. First, the sauce: In a cup and a half of water, simmer a few strips of digitata kelp, half a cup of raisins, two teaspoons of caraway seeds, a teaspoon of honey, and a few drops of tamari in a small sauce pan. Stir to dissolve the honey. Squeeze a lemon, but don’t add it to the sauce pan yet. 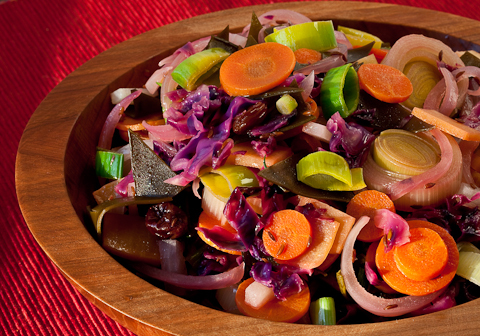 Now chop vegetables: a cup of thinly sliced red cabbage, half a cup of thinly sliced carrot rounds and half a cup of sliced red onion. Melt 2-3 tablespoons of unrefined coconut oil in a fry pan you can cover, and saute’ the cabbage/onion/carrot mixture at low heat. While these vegetables are being saute’d, cut a quarter cup of matchstick daikon radish and a quarter cup of thin rutabaga rectangles. Slice the body of a leek into quarter-inch rounds, and scissors-cut a couple of leek leaves into quarter-inch pieces. Remove the digitata from the sauce pan and scissors-cut it into triangles. Now arrange these veggies on top of the saute’d veggies, stir the lemon juice into the sauce, pour the sauce over the veggies, cover and steam at medium-high heat for 3-4 minutes. While the veggies are steaming, scissors-cut a scallion or two, and add them to the pan for the final minute of steaming. Don’t overcook. Spring is coming! It’s time to Lighten Up!